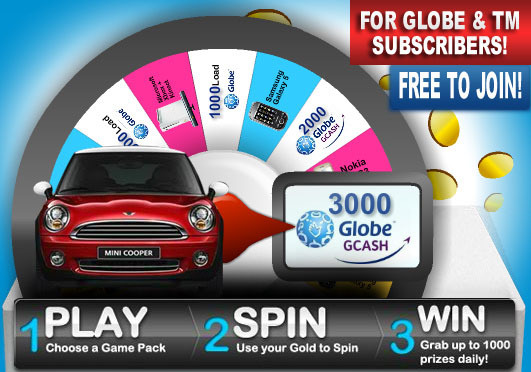 For Globe & TM Subscribers: Start tagging your friends and let them know that they can win IPAD2 & free globe load/GCASH up to 4000 pesos INSTANTLY. You can also WIN a Mini Cooper, IPAD, iPhone, iPod, Samsung Galaxy Tab, Sony Ericsson Arc and many other exciting and cool gadgets. Register now for FREE. 1. Register here. It's 100% free! 2. After you have successfully registered, you will have 3 FREE SPINs that you can use to win Instant prizes like IPAD2 and load/gcash up to 4000. You can also earn 3 free more SPINs when you subscribe to a Game Pack. You can also earn more gold when you play games. You can also refer this to your friends. Each referral wil give you FREE 10 pesos load (Extended up to May 22 only) and 100 gold. A successful referral leads to buying of game packs so that you can earn more gold.